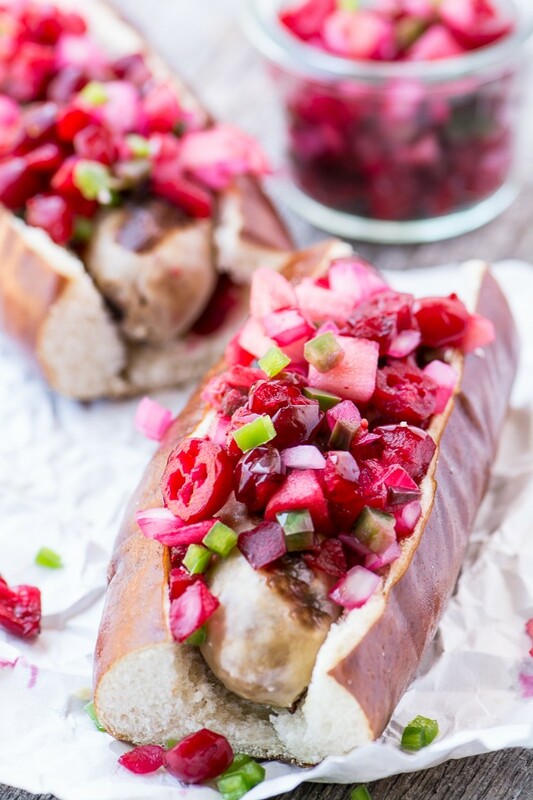 Brats with Spicy Cranberry Relish. Slowly cooked bratwurst on pretzel buns loaded up with a cranberry apple jalapeno relish. Hello Fall! Finely chop the cranberries and put them in a bowl. Finely mince the jalapenos. For more heat use the seeds, for less heat, discard them. Add to the bowl. Peel and finely chop the apple, toss with the lemon juice to prevent browning. Add to the bowl. Toss all the ingredients and refrigerate until needed. For the brats, heat a grill pan over medium high heat until hot. Prick the skin of the brats with the tip of a small knife. Brush with olive oil. Place the brats on the hot grill and brown on all sides. Put the broth in a slow cooker and turn on high. When the brats are browned, add them to the pot. Cook on high for 3-4 hours, then reduce heat to low until ready to serve. Serve the brats on buns with lots of relish.